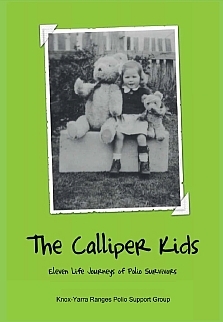 “The Calliper Kids” is a self-published book of eleven life journeys of polio survivors and was produced by the Knox-Yarra Ranges (Victoria) Polio Support Group in 2009. As a polio survivor and convenor of the Knox-Yarra Ranges Polio Support Group, I invite you to join our storytellers in celebrating the defeat of childhood polio through tenacity and determination. Many achieved careers, raised families and took on leadership roles – ordinary people who achieved some extraordinary tasks, just by living everyday lives. However as midlife arrives, we have to face the challenges of polio again and as our stories reveal, make significant changes. There was a limited print run of the books, and all copies have since been sold. Joan is now generously inviting anyone interested in reading the stories to download a PDF copy of the book. Please click the picture below to download The Calliper Kids (182 pages, 4.12 MB).